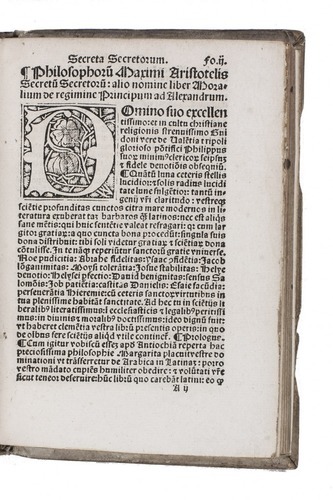 (Colophon: Lyon, Antoine Blanchard, 23 March) 1528. Small 8vo (15 x 10.5 cm). 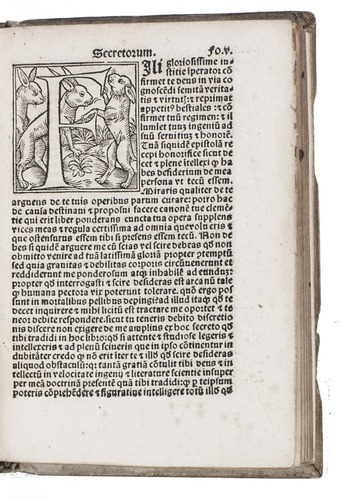 With a title-page with a decorated woodcut border, woodcut printer's device on last page, 6 woodcut initials. Contemporary blind-tooled sheepskin(?) parchment over wooden boards, in a panel design, brass catch-plates and anchor-plates (straps and clasps lost). 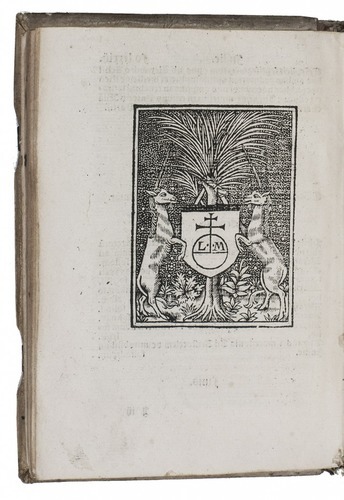 Collection of seven treatises on medicine and philosophy, edited by Alessandro Achillini (1463-1512). 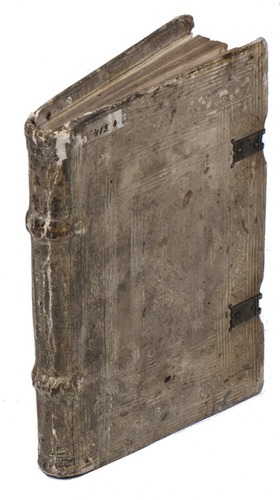 Four of these are pseudo-Aristotelian works that had been well known since the 13th century or earlier. 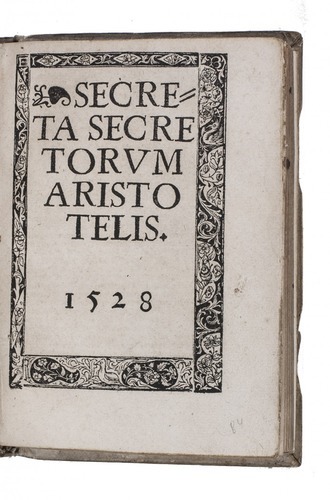 The Secreta secretorum is here present in the translation of Philip of Tripoli; the De signis aquarum, ventorum et tempestatum on weather signs, was translated in the 13th century by Bartholomew of Messina; the third pseudo-Aristotle is De mineralibus on gems; the fourth, Alexandri Macedonis ad Aristotelem de mirabilibus Indie, is a fictitious letter by Alexander the Great to his teacher Aristotle, describing the wonders of India and the East. Three other similar "Indian tractates" are known, all of them connected with the romance of Alexander the Great at various points in history. The three remaining treatises in the present work consist of a work by Alexander of Aphrodisias on the intellect, another by Averroes on the beauty of the soul, and a work by Achillini himself on universals. Very good copy, with very slight browning and a few marginal spots, lacking the final blank. Binding lacking straps and clasps, and with the (restored?) spine damaged. Baudrier V, p. 104; Stillwell 578; USTC 155810 (8 copies); cf. Lach II, book 2, p. 94 ; Thorndike V, pp. 47-48.